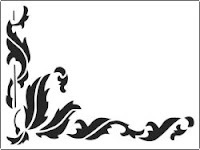 The Stencil Warehouse Blog: Ceiling Stencils! We spend hours upon hours choosing what furnishings and accessories to put in our homes, and we spend even more time searching for the right paints, stencils and wallpaper for our walls. But we seem to always forget one aspect of our interiors – our ceilings. Take a moment to glance up... What do you see? A plain, bare, magnolia ceiling looking back at you? Don’t worry; we’re sure you’re not alone. The majority of people forget about their ceilings when in fact they can make a massive difference to a room. Well here at Stencil Warehouse, we think that you should consider using our stencils to add a fun pattern to your ceiling! Painted detailing around a hanging pendant light or chandelier really can look stunning. Commissioning a professional to add one in your home can be extremely expensive! Luckily, you can easily recreate the look all by yourself using one of our stencil designs! 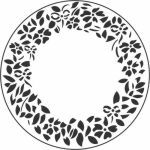 This Pretty Wreath Stencil can be used as a ceiling rose surround with great effect! You can use a classic colour or get creative and use various pop-out colours that will bring out accents in your furnishings. You could even re-use the stencil on a circular table top to integrate the theme, or perhaps on soft furnishings such as cushion covers? 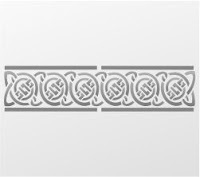 Our Celtic Stencil makes a perfect decorative border and can be used for stencilling at both dado or ceiling level. It can take strong colours and fits perfectly in large rooms with high ceilings. 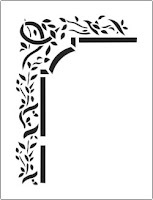 This is just one of many border and corner stencils we have which work equally well on ceilings as on walls. If you want to go even further, we think some of our large wall stencil designs look absolute beautiful on a ceiling. 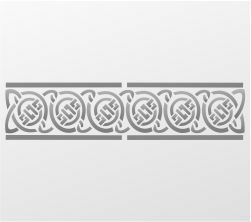 Take this Interlocking circles all-over Stencil, a stunning yet simple design of interlocking circles. A big, bold and contemporary stencil design, this stencil could be painted in bold contrasting colours or in muted shades for a softer feel. Again, the design could even be used on fabrics and furnishings to continue the theme. Feeling inspired? Why not give it a go? Make sure you send or tweet us in your pictures with your results! And if you’re still unsure, you can always give us a call, we’re always happy to answer any question you may have. Happy Stencilling!